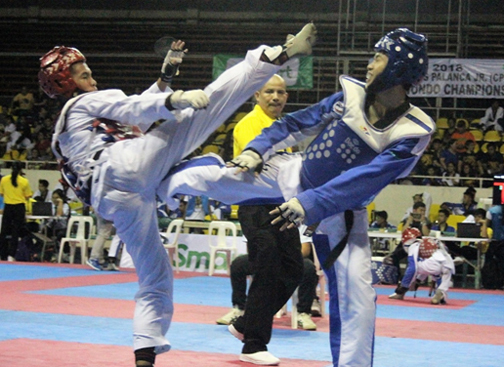 The country’s best taekwondo performers are among 800 jins who will see action in the SMART MVP Sports Foundation/PLDT HOME ULTERA CPJ (Carlos Palanca Jr.) championships on Feb. 9-10 at SM Mall of Asia Music Hall. UE’s John Angelo Benocilla, one of the top finishers in a previous CPJ event, executes a roundhouse kick against LSGH’s Hosea Marcus Calalang. Among these leading competitors who are eyeing slots on the 2019 Philippine team are Pauline Lopez, Arven Alcantara and Samuel Thomas Harper Morrison in Kyorugi (free sparring). Other veterans will bid for berths in Poomsae (forms). Kyorugi will feature senior, junior, cadet and gradeschool fighters for both male and female divisions while Poomsae competition will be divided into three divisions —individual, team and pair. Philippine Taekwondo Association (PTA) Secretary General, Makati Congressman Manuel Monsour del Rosario III, says the two-day CPJ competition will also serve as a tuneup for Philippine team members who will vie in the World Taekwondo Championships, Asian Cadet and Junior Championships, Tokyo 2020 Olympic Games (test event), ATF Taekwondo Championships and the Southeast Asian Games. The ATF Championships and SEA Games will be held in Manlla. Sponsors of the CPJ tourney include PLDT, Meralco, Philippine Sports Commission, Philippine Olympic Committee and Milo. Parents interested to enroll their children in the sport and martial art enthusiasts are invited to witness the tourney starting at 9 a.m.